Nothing in decorating makes my heart do flip flops like a little texture. Wrought iron, birds nests, rough hewn lumber, chippy paint, broken pottery, lichen growing on wood, moss in the garden, fabulously nubby fabrics, - if it has texture I love it. This morning I struck gold in blogland at the 1st Ever Wild About Mother Nature link party at Grits & Glamor. It was a small party, but I don't care, because the party is all about texture and nature so I hope she has one of these puppies every week - because I'm locked and loaded and ready to go on this one! So in anticipation of the 2nd Ever Wild About Mother Nature link party I'm going to dedicate this whole week to short (I know - whew, that last one was a bugger) posts about texture and nature in my home - and maybe my yard, but it is really cold here so we'll see about that. There is a little landing area on the first floor of my home where the doorway to my dining room, a bathroom, the guest room, the linen closet, and the office all meet. This little 2 foot wide wall is where I hang "my feet." The most special thing about this piece is the wood - which of course, like most things in my home, has a little story. In a past life, I worked with students at a small university in Kansas City. I helped coordinate a service trip to Crownpointe, New Mexico where a group of 12 or so of us rehabilitated a deserted sheep shack/home to the extent that it could be used as a home for a homeless family from one of the local shelters. 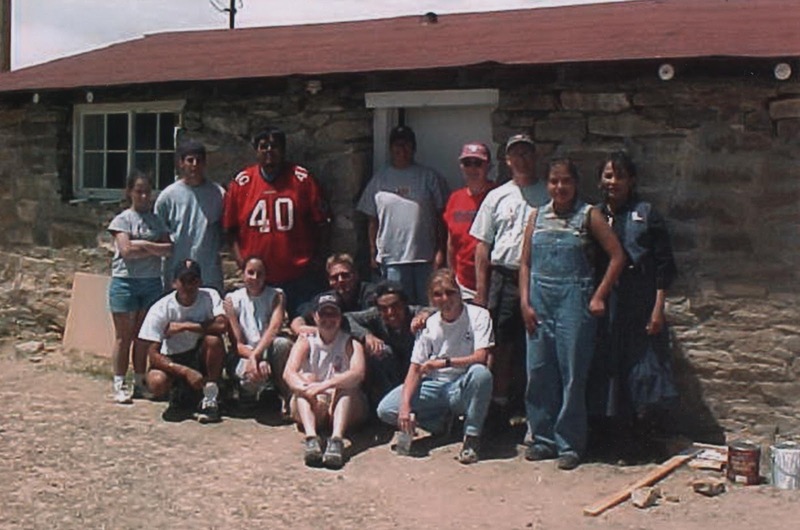 This means we dug a latrine (far away from the home) to use as a toilet, put on a new roof, removed all of the boards that covered the window openings and filled the openings with plexiglass, cleaned out the two rooms inside the "home" side of the shack, and whitewashed the adobe walls. The two ladies on the right would be living in the home along with two other children. It was a wonderful trip. Everyone thought I was crazy when we were packing to leave and I brought out the wood that I had rescued from the pile of petrified wood that we removed from the windows in the home. But I found a place to slip it in among all of the luggage and didn't pay them any mind. Now, of course I wish I had rescued the whole pile of wood. For several years I mulled over what to do with this wood, and finally ended up just hanging it as it was. It is certainly beautiful in its own right. 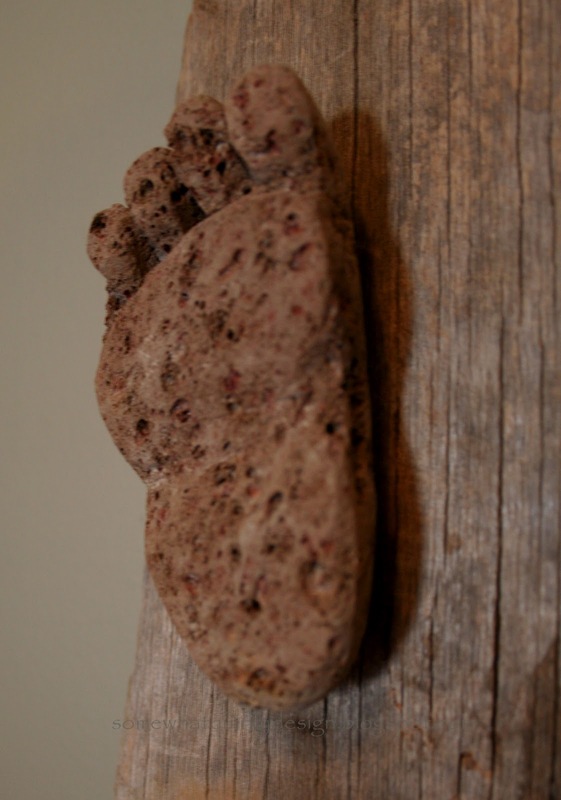 Then one day during a trip to Napa Valley, I saw these feet. They were attached to an old slab of lumber and hung above the toilet in a bathroom at the Hoenig Winery. I loved the way they looked and asked about them while we were tasting wine. Turns out they are made from lava (nature at its worst) - and are really a "cute" version of pumice stones. The winery sells them, not because they are in the foot care business, but because visitors to the winery were STEALING them from the artwork in the bathroom!!!! So as a form of self-defense (or art-defense in this case) they offered them for sale. I like seeing them. They kind of remind me of the Footprints In The Sand story....or remind me to keep moving forward in life, no matter what the past has brought my way. Now maybe if I am really lucky I get to party next week with other lovers of texture! Good deal! See you at the party! Thanks for stopping by! I've tried 3 times to reply to you so please forgive if I'm bombarding you, but it isn't showing up here. I'm a follower - could probably learn a lot from you.